Review, enable, or disable browser add-ons for faster web surfing. The Browser Add-on Manager lets you review each toolbar and add-on that is loaded by Internet Explorer. Having lots of extra toolbars and add-ons can slow down web surfing and browser speed. By disabling unwanted add-ons Internet Explorer should open faster, load pages quicker, and provide a better web experience. Best of all, My Faster PC will show recommended settings for common add-ons to make it easy to disable items you don't need. Toolbars, extensions, browser helper objects, and other add-ons are often added when you install software. Some of these add-ons can be useful tools that use every day. But many of these add-ons are just unnecessary junk that can bog down your browser. Add-ons can also cause redundancy, for example, if you have two or three search toolbars (like Yahoo!, Bing, and Google) you may want to remove two of them and only keep the one you really use. To use the Browser Add-on tool, just click on the "Browser Add-ons" button. Scroll through the list to find items you want to keep enabled or disable items you don't need. 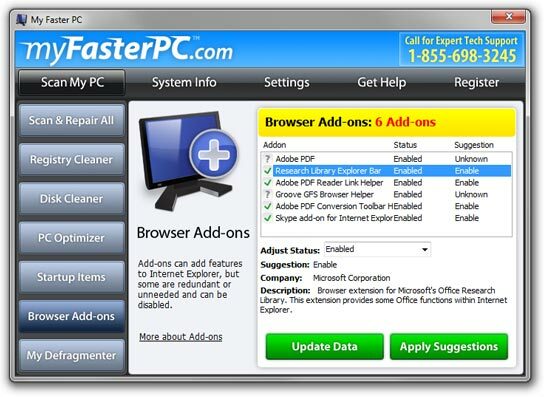 My Faster PC will provide suggestions and descriptions for many common browser add-ons. You can even automate the process and let My Faster PC manage your add-ons for you.